Last week our blog offered tips on how to move your hot tub closer to your home should you feel it’s too far away to enjoy during cold snaps. This week, we thought we’d focus on general precautions to take when hot tubbing in winter, regardless of where you’ve positioned your spa. 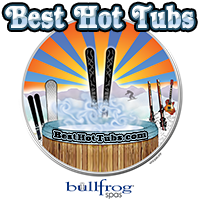 No one appreciates more than Best Hot Tubs (or maybe those at our product manufacturer, Bullfrog Spas) how wonderful it is to use your spa in winter. Being outdoors in the chilly air, immersed in bubbly warm water — all while having a therapeutic massage — is why you got your hot tub in the first place. That said, when the weather is very cold, you’ll still need to take some precautions like wearing a cap, even when enjoying the spa’s heated water. Also, when going to and from the spa, be sure you have on a bathrobe and slippers. Remember, you’ll be in a wet bathing suit. Also, you might want to think about where you’ll keep your robes etc. while in the hot tub. If you leave them out on, say, a chair, they might be stiff and cold and not much use when getting out of the warm water. Perhaps keep them nearby in a cooler, or hang them near a fire feature, or on a warming towel rack, etc. 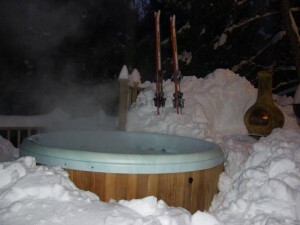 Even though your spa water will be very warm, some Best Hot Tubs clients invest in a variety of warming devices to position near your hot tub. One of our clients recommends an outdoor umbrella heater (left) which uses the same propane as their barbecue. “It’s a stand-up heater where we put a 3M hook on it for hanging our robes,” says our client. Of course, fire features like fire pits, tables and fireplaces (above/right) are very popular. We invite you to check with our Best Hot tubs showrooms if you are interested in adding one of these. Use your cover in winter. An insulated cover reduces the energy needed to run your hot tub by helping to keep the heat in. Also, because falling snow, sleet and even rain will change the water chemistry, using the cover reduces the amount of chemicals you’ll need. Note: You can prolong the life of your cover if you don’t depend on the warmer temperatures, that tend to follow snow or icy weather in the Northeast, do the work. 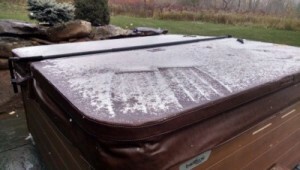 Instead of waiting for the melting process, brush the snow/ice off your hot tub before it melts. Otherwise it can get waterlogged during melting which can ruin the cover. 4. 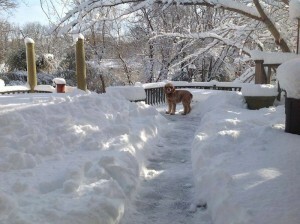 Yes, Shoveling May Be Required. When it snows, the first thing to do is to clear a path to your hot tub — not just so you can use your spa — but so you can maintain it during freezing or snowy weather. Besides, your pet will be grateful as well.